We’d love your help. Let us know what’s wrong with this preview of Medea by Liz Lochhead. To ask other readers questions about Medea, please sign up. I liked this adaptation of Medea (which is not one of my favorite Greek plays), but I really only have two things to say about it. 1) Lochhead's adaptation seems to move quicker than Euripides' play and many of the other adaptations I've read, which I really like. Plays that drag are challenging, and I feel like the pace in this version was brisker than in many other versions. This is especially important for a play like Medea, which really kind of relies on the shock of the incredible violence I liked this adaptation of Medea (which is not one of my favorite Greek plays), but I really only have two things to say about it. 1) Lochhead's adaptation seems to move quicker than Euripides' play and many of the other adaptations I've read, which I really like. Plays that drag are challenging, and I feel like the pace in this version was brisker than in many other versions. This is especially important for a play like Medea, which really kind of relies on the shock of the incredible violence for much of its effect. Another great adaptation by Liz Lochhead. A spectacular play. I realize I may be cheating with the amount of plays I've suddenly updated, but HEY, I READ THIS OKAY? And meh, that is about all the excitement I can muster. Liz Lochhead is a Scottish poet and dramatist, originally from Newarthill in North Lanarkshire. In the early 1970s she joined Philip Hobsbaum's writers' group, a crucible of creative activity - other members were Alasdair Gray, James Kelman and Tom Leonard. Her plays include Blood and Ice, Mary Queen of Scots Got Her Head Chopped Off (1987), Perfect Days (2000) and a highly acclaimed adaptation in Liz Lochhead is a Scottish poet and dramatist, originally from Newarthill in North Lanarkshire. In the early 1970s she joined Philip Hobsbaum's writers' group, a crucible of creative activity - other members were Alasdair Gray, James Kelman and Tom Leonard. Her plays include Blood and Ice, Mary Queen of Scots Got Her Head Chopped Off (1987), Perfect Days (2000) and a highly acclaimed adaptation into Scots of Molière's Tartuffe (1985). 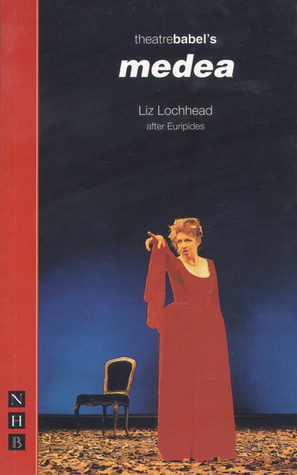 Her adaptation of Euripides' Medea won the Saltire Society Scottish Book of the Year Award in 2001. Like her work for theatre, her poetry is alive with vigorous speech idioms; collections include True Confessions and New Clichés (1985), Bagpipe Muzak (1991) and Dreaming Frankenstein: and Collected Poems (1984). She has collaborated with Dundee singer-songwriter Michael Marra.